It’s never a good idea to read the book of Ecclesiastes while in anything other than a fantastic mood, because it’s such a gloomy book. This isn’t so much an exegesis than a rant, perhaps. There is really one way to read it – read it, and cling on to God. Solomon puts it plainly right from the first chapter of the book – everything is meaningless. In today’s study, we will examine one major aspect that makes up this ‘meaninglessness’ – the wearisome nature of all things, and in the process of agreeing with Solomon, discover how to live through hope in God. 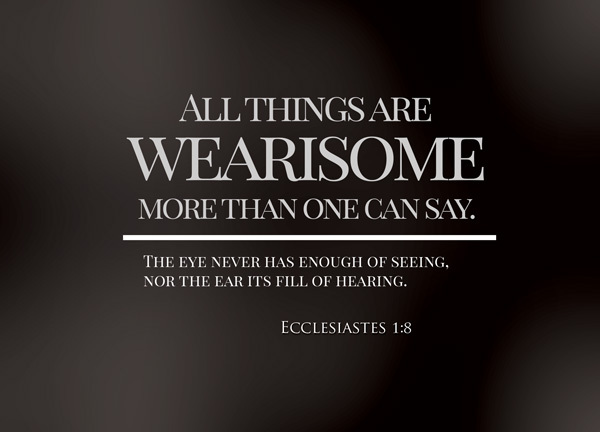 All things are wearisome – What do you do in life? Imagine an average office worker, wakes up at 7 or 8 in the morning, gets working by 9, works till lunchtime and gossip with colleagues, work again and have a meeting or two, go for dinner after work, watch some television, browse social media, and if a Christian, do a quick QT, and go to bed. The next day, repeat, until the weekend, where it’s an event or an outing, or two, hanging out with friends or family, going to church, and sleeping till late. Work is laborious. Social interaction is exhausting. Entertainment is mundane. QT is a routine. Studying fatigues. Exercise is burdensome. Even if there is passion, even if you like doing a certain thing, it requires labour, it requires commitment, it requires a favorable season in life. After some time, everything becomes mundane. You gain some joy out of horsing around with your mates. You gain a sense of achievement from clinching a new deal. You gain new awe from a new piece of knowledge. And what’s next? Repeat. more than one can say – even the teacher finds it hard to put this in proper words. It is impossible to fully articulate the monotony of life. But, having lived life before, you will experience it, and you will understand what Solomon meant. It is something beyond the textbook, it is something beyond words. It is a phenomenon that the English language does not have a word for – some renditions state wearisome, some state tiresome, some state full of labour, but really, the long-term and eternal bleakness of this phenomenon is not something a word like ‘wearisome’ can do justice to. It is a sense of jadedness that is commonly found in people who have mid-life crisis – huge achievements, fat paychecks, happy family, bright future, but feeling utterly empty. In reading the book of Ecclesiastes, perhaps it makes sense to reread Ecc 1:2 [Article] after every other verse – Meaningless, meaningless, utterly meaningless. Everything is meaningless. the eye never has enough of seeing – we see new things. We see old things. Our sight is a very valuable asset, and it makes up a huge part of who we are. We depend a lot on our sight, but what we see can never satisfy us. Many of us travel miles and miles just to see a new sight. Snow. The sunset. Horizon. Northern lights. Sakura. The list goes on and on. We love seeing new things. That’s why zoos exist. That’s why tourism is even a business at all. New people, new cultures, new food, new things. We are stimulated and excited by the new and mysterious. It is one goal after another. Seeing one new thing, it becomes old and we lose interest in it, desperately searching for the next new thing to see. Our lust and greed in seeing something new never ends. Our sight is never satisfied. We never see enough results. We always want more. nor the ear its fill of hearing – It is the same logic, yet perhaps it goes even further. Ask a new parent what he or she enjoys hearing from their child most. ‘Papa’. ‘Mama’. Ask if they ever get sick of hearing it. I doubt so. Ask anybody if they ever get sick of hearing praise and compliments. I doubt so, even if some insist they do. Perhaps not flattery – but I do believe that our ears are never sick of hearing new compliments come our way. Compliments that nobody has made us before. It is the same thing. We don’t rest and think that, having heard this lecture, I have had enough knowledge. Having heard the first song in a concert, I have heard enough. No, we ask for more, encore after encore, score after score. Applause and cheers and standing ovations. Admit it. We love it. But ask a performer what they feel after the umpteenth encore has ended and the crowd has departed, as he or she stands alone on the stage in a mighty, but empty hall. Perhaps a strange sense of emptiness, as the fleeting sense of achievement and joy fades with their adrenaline? What it results in, is just a perverse need for the next concert. At some point, it becomes wearisome and meaningless. This all sounds so bleak and is so gloomy. We can refute Solomon’s philosophy, but for most people, there will likely be moments when we find things wearisome. Most of us may even be inclined to agree with Solomon, that everything becomes full of labour. Life becomes unlivable if we agree with Solomon. The only way to continue to persist in living this wearisome life while retaining our sanity – without denying that life is wearisome – is really to draw on the strength of the Lord. The hope of eternity adds an eternal value to the things that we do, and an infinite value to the future that we hold. The word of God empowers us to find meaning in life, where we once lost meaning. This isn’t to say that non-believers lead meaningless life – but the meaning to their lives end when their lives end. That is quite wearisome, isn’t it? If life is getting wearisome for us, perhaps it is time to rethink where is the eternal value in what we are doing. Only when we identify the eternal value, will we be able to continue with joy and fervour.